Read an extract here — published in The Daily Beast. His father conceived of the Brooklyn Bridge, but after John Roebling’s sudden death, Washington Roebling built what has become one of American’s most iconic structures—as much a part of New York as the Statue of Liberty or the Empire State Building. Yet, as recognizable as the bridge is, its builder is too often forgotten—and his life is of interest far beyond his chosen field. It is the story of immigrants, of the frontier, of the greatest crisis in American history, and of the making of the modern world. 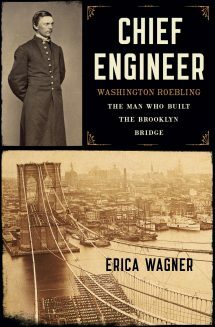 Forty years after the publication of The Great Bridge, David McCullough’s classic chronicle of how the East River was spanned, Erica Wagner has written a fascinating biography of one of America’s most distinguished engineers and celebrates his greatest achievement: Chief Engineer: Washington Roebling, The Man Who Built the Brooklyn Bridge is enriched by Roebling’s own eloquent voice, unveiled in his recently-discovered memoir that was previously thought lost to history. The memoir reveals that his father, John—a renowned engineer who made his life in America after humble beginnings in Germany—was a tyrannical presence in Washington’s life, so his own adoption of that career was hard won. A young man when the Civil War broke out, Washington joined the Union Army, building bridges that carried soldiers across rivers and seeing action in many pivotal battles, from Antietam to Gettysburg—aspects of his life never before fully brought to light. Safely returned, he married the remarkable Emily Warren Roebling, who would play a crucial role in the construction of the Brooklyn Bridge. Roebling’s work on the bridge pioneered new building methods and materials but broke his health; he got the bends from high air pressure in the underwater caissons where workers excavated the foundations. When he became incapacitated, Emily acted as his amanuensis, relaying his detailed instructions to workers on the site. Nearly a century and a half after it was begun, the Brooklyn Bridge remains a wonder, its image displayed on tourist brochures, film posters, and even Italian chewing gum. The story of its construction, one of the greatest emblems of progress in the nineteenth century, is celebrated in CHIEF ENGINEER, a dramatic tale of vision, innovation, and endurance in the face of extraordinary odds.